Gateshead International Jazz Festival is back! As always there’s the best of the UK, European and International jazz scene, hotly-tipped emerging talent and exciting cross genre artists with a programme that truly brings something for everyone. The festival, the UK’s biggest held under one roof, runs from Friday 15 – Sunday 17 April 2016 at Sage Gateshead. composer (renowned for his work on Spike Lee’s movies), and former member of Art Blakey’s Jazz Messengers Terence Blanchard brings his new quintet, the E-Collective, in a powerful fusion of funk, R&B and rock. Headlining Sunday night is American soul maestro Charles Bradley. His well-documented against-all-odds rise saw him transcend a bleak life on the streets before being discovered by Daptone Records. Following the release of his debut album No Time Dreaming, his performances have earned rave reviews. Other artists announced include award-winning singer-pianist Liane Carroll, described by Jamie Cullum as ‘one of the greatest singers we have in this country’. Saxophonist John Surman emerged as part of a gifted generation of British jazz artists in the 60s – proving the age gap is no barrier to creativity, he is joined in a brand new quartet by the Alexander Hawkins Trio, featuring three of the UK’s finest young jazz performers. British-Asian clarinettist and composer, Arun Ghosh, has been captivating audiences and critics alike with his trademark IndoJazz sound and Ibrahim Maalouf, widely regarded as one of the finest trumpeters of his generation and a pioneering figure in the contemporary jazz world, fuses pop, electro, soul, hip-hop with the music of his Lebanese roots in the UK premiere of his super-charged new Impulse CD Red and Black Light. Café Society Swing features stellar vocalists and some of the UK’s finest jazz musicians in a show that tells the true story of the legendary New York nightclub which promoted racial equality and great music. Following sold-out gigs at Ronnie Scott’s and the Brecon Jazz Festival we’re pleased to welcome awardwinning British jazz saxophonist Simon Spillett and his quartet to the festival in a tribute to a revered British modern jazz star of the 50s and 60s, the late Tubby Hayes. The performance will follow a screening of the documentary film, Tubby Hayes: A Man in a Hurry, released earlier this year. Fans of free jazz and improvisation will be treated to a solo performance from one of the most admired and influential saxophonists on the planet, Evan Parker. Award-winning British punk-jazz-funk specialists, WorldService Project bring to the festival high-octane experimental but accessible music – think Frank Zappa, Loose Tubes and Stravinsky, played loud. As always the festival brings some of the newest and brightest lights on the international jazz scene to Gateshead. New York-based pianist and composer Kris Bowers is a leading voice in a vibrant new wave of genre bending jazz musicians. He collaborated with Jay-Z and Kanye West on the hit album Watch the Throne, scored movies, and is a past winner of the coveted Thelonious Monk International Jazz Piano Competition. arrangement for larger forces of his acclaimed suite Lifecycles. Airelle Besson’s sumptuous trumpet sound is catching the ears of listeners far beyond her native France. from jazz through classical music and electronica – together in his new project, Congregation. The festival, produced by Sage Gateshead and London-based music producers Serious, is now in its 12th year. The ever popular free programme of jazz on the Concourse returns where on Saturday BBC Radio 3 will present a selection of national and international jazz artists recorded for a future edition of Jazz Line Up and on Sunday Jazz North East, celebrating their 50th anniversary year will present their choice of local and Northern artists. Plus there will festival workshops, family fun, talks, late night club and much more still to be announced. Keep an eye on the website for further updates. With all events taking place under one roof it couldn’t be easier to move between concerts and try something new. Bookers can take advantage of the Jazz Multi-Buy – the more concerts booked across the weekend the more money saved. Tickets go on general sale Friday 27 November, 10am online at sagegateshead.com and 12noon at Ticket Office either in person or by calling 0191 443 4661. Sage Supporter pre-sale takes place on Thursday 26 November from 12noon at Ticket Office. We live in a very small world now don’t we? One of our regular readers got in touch about this album, after hearing a track on an Americana Radio Show broadcast in heartlands of North Yorkshire. Coincidentally the DJ himself; a member of Americana UK got in touch a week later asking if I’d like a copy of the album! Yesterday I was on another boring car journey when Cecil Hotel popped up on the Ipod shuffle and I found myself double checking to see if this was a track by Lucinda Williams or Mary Gauthier that I’d forgot about. It wasn’t; but it’s certainly in their league. Smoky vocals, rolling guitars and a pedal-steel that will make your spine ache accompany a humdinger of a sad Country song that features the immortal lyric ‘I sleep with one eye open/and a shotgun by my bed.’ You have to take notice of a song like that don’t you? I then put the album on and following the darkly beautiful slice of Country-Folk, Gravedigger that opens the all too short album I was entranced for the next two hours. Run Johnny Run; is the type of Honky-Tonk tune you dream of hearing coming out of a Nashville or Austin bar; but somehow never do; but that possibly because this native of Ottawa in Canada doesn’t play there often enough! Out of the seven tracks here it’s nearly impossible to separate them for quality or sustainability; but I have to go for the slightly Gothic, Black Widow for my favourite track here. Strong, imaginative story that, again evokes memories of songs by Lucinda and Mary Gauthier at their very finest. A pin sharp production by Lynn Miles really showcases Lynne Hanson’s delightfully, weary and weather beaten voice while an assortment of instruments purr in the background like a Classic Car engine. Only a couple of weeks I was bemoaning the fact that no one was sending me ‘roper’ Country albums any more; then ‘as if by magic’ this arrived in the post; followed by another 5 from both the UK and USA. As soon as I saw the cover and enigmatic title I was pretty sure I was going to like the contents’ and by jimminy I was right. The opening track starts with some delightful piano and maudlin fiddle before that fiddle gets warmed up and Lindsay’s sultry voice kicks into first, then instantly second gear on This is Gonna Hurt; a really bouncy break-up song. Straddling the Classic Country of Reba and Martina, with the Outlaw side of Elizabeth Cook and Stacie Collins; Lindsay punches you right in the heart with Drink About You’ a song the first two ladies there would be proud to cover. Goodbye/Go is a real humdinger too; perfect for daytime radio or belting out loud on the car-stereo. Hate That I Love you is a genuine Old-School duet; with Lindsay letting him know his place and he’s on his last warning; but they both know she won’t really let him go. Hope that’s not a spoiler. Again; there’s not a bad song here; but two in particular stand out as timeless and Classy Country songs of the finest order. Train Wreck is an absolute belter; about a young woman who regularly goes out for ‘just one drink’ but comes home ‘still in last nights clothes/whisky on her breath/smelling of cigarettes’ after ‘standing on the bar singing Skynard song!’ Great imaginative lyrics and a tune to die for. Loved it. But; and it was only by a whisker, my favourite track here is the beautifully sad, Let’s Be Lonely Together. That haunting fiddle makes another appearance on the saddest duet of the year; with the couple both knowing they are wrong for each other, but……….. In typical Country fashion; and the type of ‘proper’ Country I adore nearly all of these songs are about lovin,’ leavin, regrettin’ and rememberin’ and sung with a sassy panache from start to finish. Where The Blues Meets Rock and Roll on a Rural Country Crossroads. It’s well documented that the Alvin Brothers had a Sicilian style fall out that lasted years; until they made their peace on what may have been Phil’s death bed. Notoriously argumentative; they chose to record an album of Big Bill Broonzy standards as a compromise; but as I said at the time it was an opportunity missed. Following their tour to celebrate Common Ground; they have put that wrong right by rushing into the studio, making an album of songs by people they both loved when growing up. OOOOOHHHH; opening track Oscar Brown’s Mr. Kicks is a veritable doozy! Razor sharp guitar, Dave Alvin singing at his very best on a song that straddles the Blues and Country Rock – what’s not to like? The whole album chugs along in a similar manner with Dave again sounding like he’s having a ball on Blind Boy Fuller’s Rattlesnakin’ Daddy, featuring Phil on harmonica so powerful it will make saxophones redundant. Phil certainly doesn’t hide his light under a bushel; especially on Big Joe Turner’s racy Hide and Seek . There’s plenty of Rock n Roll titles hidden on a real humdinger of a dance tune; and I’m pretty sure everyone in the studio was dancing along on every take. I’m a big Dave Alvin fan; but on this album I can finally see why even he claims big brother Phil is a great singer. On another Big Joe Turner cut; Wee Baby Blues Phil Alvin doesn’t just sound salacious as he tries to seduce a young lady but downright lustful; and ain’t that the way the Blues should be? Obviously Dave is no slouch either and his reinterpretation of House of the Rising Sun (here called In New Orleans/Rising Sun Blues) is a toe-tapping Hillbilly dance tune; possibly it’s true Roots – who knows? But I love this and can picture a video in a Saloon bar full of Cowboys and full bosomed ladies as the band play their hearts out on the corner stage. (I have an active imagination). When I saw the Alvin Brothers last year the highlight of the concert was Phil’s take on the James Brown classic, Please, Please, Please and here it is in all it’s lung busting glory! I can’t begin to imagine what this guy must have sounded like twenty years ago; but I thank the Lord he has finally entered my life at this late stage. Speaking of which the album closes with the brothers performing a Country-Gospel duet, If You See My Saviour and it’s so good it could actually get me back to church if we had Pastors that sounded this good. Some songs here are well known and others from the shadows; but the overall result is an unquestioning winner; combining every single strand of Americana music; throwing it in the air and making it their very own. I had only previously been aware of Le Harvey Osmond because of the wacky way he spells his name; but during my recent convalescence my friend Lorna in the colony of Canada inundated me with You Tube videos to aid my recovery; and once I’d made the mistake of saying I ‘liked’ one of Osmond’s songs I went on to receive pretty much his whole back catalogue; so perhaps by the time I received this actual album I was already brain-washed. Halfway through opening song Loser Without Your Love it’s evident that LHO aka Tom Wilson from Blackie and the Rodeo Kings, ain’t no ordinary singer-songwriter. The lyrics alone are rather lovely; but the instrumentation glides between Van Morrison, Chris Isaak and; if you were lucky enough to hear his albums, Billy Bob Thornton. On Blue Moon Drive there’s even a Nightclub-Jazz feel as Osmond’s vocals are smoky and breathless as a funky bass, brass section and even a xylophone tinkle away in the background. I even found myself doing a little shuffle as I made a pot of tea when listening to the enigmatic Black Spruce; and the occasional flute solos have to be heard to be believed. The only track here to hint at Osmond’s day job in Blackie and the Rodeo Kings is Hey Hey Hey; but that’s only because I know that fact, otherwise it is just a great piece of atmospheric Alt. Country done in the way only Canadians know how to do. Shake The Hand opens with some feedback before a band slowly drifts in as Osmond uses echo on his voice in a way that will scare small children; but not me – I love it and could listen to a whole album in the same manner. Billy Bob Thornton again springs to mind on the dark and menacing How Does It Feel? Osmond’s deep voice, piano and the piercing slide guitar juxtapose in an intricately clever way; making the song especially memorable. On the final track Osmond almost drifts into bedsitter-songwriter territory on Bottom of Our Love; but his warm baritone voice and gorgeous duet with Andrea Ramolo makes it extraordinarily good ; and had me gagging to hear more. LeE HARVeY OsMOND ? Well worth seeking out in my humble opinion. Trad Ska With a Modern Urban Twist (and Shout). I first discovered the joys of Ska and Bluebeat via Madness and the Specials; who were Top of the Hit Parade in the late 1970’s and 80’s. Because of them I delved deep into the history of Ska and discovered Prince Buster, The Skatalites and of course, all things Trojan. As a long term fan of the ‘Meanies I’m pretty sure they had a similar journey and this, their third album in 18 years showcases just such a lineage; all made with class and love. I was a tad worried that the gang had gone All-American Ska-Punk when I heard the opening chords of Gut Punch which kick starts the album; but after 30 seconds it was back to good old-fashioned danceable Ska with the foxlicious Jane Chalmers proving she is still the finest female voice in the genre. Next out of the traps is the bittersweet foot-stomper The Wrong One; which showcases the bands musical attributes from start to finish; and again Jane takes it into a whole new stratosphere, worthy of Top of the Pops were it still going. I love John ‘Clark’ Disco’s choppy guitar intro to Nothing’s OK and when the band come in swinging their instruments it felt like a scene from The Warriors and I found myself ducking for cover. It’s a real belter of a song btw. Their collective love of Trad Ska gets an outing on the (all but) instrumental Horses For Courses; but when the lads chant the title in their Glaswegian accent; it takes on a whole new meaning, that made me giggle. Be Yourself with Stan Millar taking over lead vocals, has a cool classic dance groove to it; but that just masks a dark tale that many of us listening will sympathise with; in the way we did with Bed and Breakfast Man and Embarrassment by Madness. Stan closes the show with their take on getting old and everything being ‘bad for you’ – No Fun Tomorrow; but the last verse just may have a little twist in the tail #wink. For me British Ska; of which the Amphetameanies are the current Heavyweight champions, is all about having a laugh, a drink and a dance; but don’t think for a moment that this ever gets close to being sloppy; these guys are all utter professionals and the sound they create is pure, dead glorious. 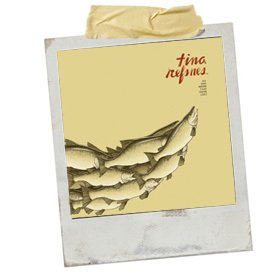 Before I read the Press Release that accompanied this album I was convinced that Tina Refnes was an English Rose; what else could she be with her crystal clear annunciation and intelligent use of prose. Well; dear reader Ms. Refsnes did spend four years living in Liverpool; but hails from the small Norwegian town of Floro; and has lived in Oslo for several years now. Track #1 I Don’t Know begins with an interesting drum pattern followed by Tina’s clear-cut voice on one of the more upbeat songs on the album; but even then it is reminiscent of early Cowboy Junkies or perhaps our own Kate Rusby. That song only gives you a false sense of security because immediately afterwards Leave This heart is melancholic, Gothic even song that really showcases her voice and intricate songwriting skills. Only four songs in I knew that this wasn’t ‘background music’ and I had to stop what I was doing and concentrate. The Heart Wants Its Way is a tragically fragile song, that will be best listened to late at night, surrounded by flickering candles and an already broken heart. This is probably true of most songs actually; as none of them are easy-listening; all are stories that demand your full attention. I think it was on the fourth play of the album that I realised halfway through Told that I was holding my breath; possibly because I didn’t want anything to obscure what I was hearing. Not something I remember ever doing before. My favourite song here is the lovely Spoilt Rotten Blues; where Tina Refsnes manages to combine the quirkiness of Bjork with the harmonies and soaring vocals of the Unthanks. By the time you get to the final track, Song About Trust you will doubt your ears and brain and immediately have to go back to the beginning. I’m writing this on a grey, cold and wet November Sunday; making ‘No One Knows That You’re Lost’ a perfect soundtrack. While a stalwart of the local music scene for many years; Trevor Sewell became an overnight success a couple of years ago when his second album Independence won several prestigious Blues awards in the US of A. Following a live acoustic album; recorded and released following those awards; Hollow is his third studio album; and wow has he made a massive leap forward. Blues music comes in many shapes and formats; personally I love a good guitarist; but one who lets his instrument accompany his songs (or her songs) and Mr. Sewell does that with great elegance. 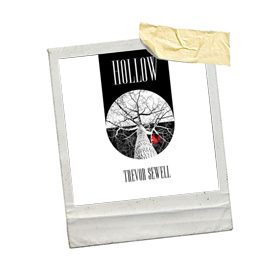 Opening with the title track Hollow; Trevor throws his fans a curve ball by adding some mystical African drumming to the background of a razor sharp song, about losing the one you love, and will be worthy of even more Awards, if I’m not mistaken. Track two, Shaky Ground is actually familiar territory with Sewell’s world weary Northern voice taking us on a sad, lightly political (with a small p) song about not leaving home and the people you love; when the going gets tough. A song that will resonate with many reading this in the North East and, indeed around the world. This is the real Blues, baby. Trevor changes track again on the delightful, As Long as I Can Breathe when he includes a mandolin in the background on a delightful love song about sticking together through thick and thin; something the young ‘uns around us could do well to listen to. Tucked away in the middle is a classic slice of heavy British Blues that does the genre proud after all these years; Ain’t That The Truth could be a lost Free, or possibly even a Cream track; but it’s not, it’s the Trevor Sewell Band in all their majesty; and not to be ignored at any price. After playing the album 5 or 6 times it suddenly dawned on me who Trevor Sewell reminds me of a wonderful Chris Rea/Joe Cocker/Eric Burden hybrid! The guitar playing here will appeal to fans of those Superstars too. With that in mind; my favourite and arguably best track on the album is kept until second to last. All I Need is the Truth is a terrific story; classic Modern Blues song sung as if the guys life depends on getting his message across and the searing guitar will set your hair standing on end. The album ends with Hollow Pt2. and from the spooky guitar/harmonica interplay that opens it will have you sitting to attention and the reprise is a great way to close a really interesting and memorable album. Trevor Sewell has shown his credentials on previous releases; and here he doesn’t take any prisoners, but will win legions of new fans across both sides of the Atlantic. Country-Blues so Raw You Will Need Band-Aids For Your Heart. I’ve played this album a lot over the last week and enjoyed it in a bitter-sweet way each time; but wish I’d heard it and reviewed it before I saw him play live. A few years ago I immersed myself in all things Robert Johnson, Charlie Patton, Reverend Gary Davis and more; so much so I think I sickened myself of that style of Blues……until recently. There’s been a bit of a resurgence among the young musicians of my home-town in Newcastle; led by the Monkey Junk Blues Club which has spawned quite a few talented singers and guitarists onto the ‘scene’. Then along comes Jerron Paxton; who is so talented, not only as a singer and multi-instrumentalist but as a songwriter too; leaving everyone else in his wake. Although recorded in 2015, if it wasn’t for the pin sharp production you would swear every track here had been written and recorded before WWII. Opening with Massa I’m a Stingy Man; Paxton makes his banjo sound almost Classical at times; and his voice sounds as authentic as possible; never ever straying into parody. I’ve lost count of the amount of versions of Motherless Child Blues I have; but this interpretation sounds every bit like what I’d hope to hear if I was transported back to some Hicksville Juke-joint in the 20’s; but I doubt anyone then could play a guitar as well as this young man. Jerron’s dextrous finger picking style shines throughout the album; but what I like best is his ability to never play three notes when one will suffice. I don’t know when Country-Blues had their fall out and went their separate ways; but Jerron Paxton just may be the man to bring them back together again for the long haul; especially if the sea-shanty influenced (honestly) Glendy Burk is anything to go by; and I ain’t heard a harmonica played that well for a lot of years. Apart from the charming Lost My Appetite For Chicken; the thing I’ve missed here is the mischief and humour that his concert was full of and proved that the Blues doesn’t have to be miserable. Here ‘Chicken’ is played straight and is quite fine; but when he sang it live I actually laughed out loud twice to the same words. Not necessarily my first choice of tunes but here the traditional Folk song, Soldier’s Joy played on the banjo is actually exciting; most unlike the terminable version I learnt at school. Interestingly it is immediately followed by the Lutin Reel which really showcases his skills on the fiddle; making it a real thing of beauty. 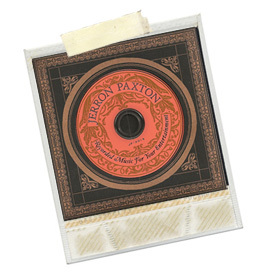 Two years ago Jerron Paxton would have disappeared without trace; but here in 2015 the World is finally ready for authentic Country-Blues of this quality. Recorded Music For Your Entertainment is an excellent title and exactly sums up what you hear. This was another gig that I’d been looking forward to for months; primarily because Sugar and the Hi Lows were the opening act. Don’t get me wrong I really liked Kacey Musgraves Pageant Material album; but Amy Stroup and Trent Dabbs’ ‘supergroup’ Sugar and the Hi-Lows have been a family favourite for a couple of years. The evening didn’t get off to a great start when my photo-pass had a restriction attached and I was only to shoot from the mixing-desk at the back of the room. Rules is rules; but I’ve never understood this one; especially as several people in the ‘pit’ had really good pocket cameras with zoom lens’ that could pick out the singers nasal hair. Thankfully the floor manager saw my dilemma and secreted me about 1/3 of the way back for the headline act. 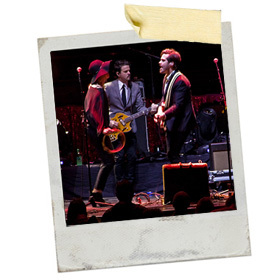 I was thrilled to see Sugar and the Hi-Lows actually had a band with them; and what a hot band they were in their snazzy sports jackets, white shirts and black ties. I was a tad disappointed to see the delectable Ms. Stroup wearing a big floppy hat, which masked her face but complimented her all black outfit; making her look like a Goth Stevie Nicks; especially when she played her tambourine. Trent Dabbs on the other hand was resplendent in a suit; and he was particularly chatty between songs and even performed a soft shoe shuffle a couple of times, mid song. Predominantly playing material from their second album High Roller; they soon had the excitable Kacey Musgraves in the palm of their hands. Even the quirky Bees Left The Trees were received well; but the title track High Roller and the excellent cover of Jackson both received whoops of delight mid song. I can’t wait to see them return soon; and I’m pretty sure they could fill either Hall 2 or the Cluny on the other side of the river without too much effort. When I returned to the hall after the break the stage was now adorned with a pink backdrop and numerous spangly stars and glitter balls. With everyone in their seats the house lights went off completely as the band members made their way onto the stage lit up like Christmas trees. Their bright raspberry suits were decked out with fairy lights along every seam; much to the crowds’ delight. 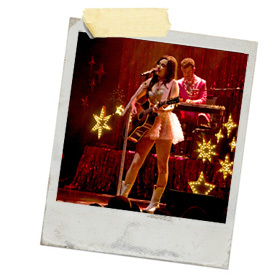 Although not lit up; Kacey Musgraves looked amazing in a pink taffeta rah-rah dress, spangly tights and white cowgirl boots. Beaming with excitement the band got the hoe-down started with one of her signature tines Biscuits; which was greeted with screams from the scores of teenie fans and their Mothers too. The last few bars were accompanied by the singer doing a bit of a dosey-doe dance. After four songs Kacey misjudged the audience by playfully saying “ tonight isn’t the night for being reserved,” then playfully demanding everyone stand up. Most did; but there was noticeable grumbling around me; but a group of tiara wearing fans were in their element a few rows away. The ‘misjudgement’ was because while her songs are truly excellent; they are primarily for listening too and not necessarily dancing too; as was proved immediately that song ended and everyone sat straight back down. I’m not sure if this threw Ms Musgraves or what I think may have been monitor problems but she wasn’t nearly as chatty for the next few songs; and kept ‘looking daggers’ at the side of the stage. That and the constant changing of guitars/banjos/mandolins in between songs that broke the flow were a relatively small price to pay when we got to hear great arrangements of This Town’s Too Small For Me, Family is Family and Dime Store Cowgirl; which had a really funny and touching introduction. I actually recognised more songs than I expected; but one really deep Country song called Yellow left me baffled; until, on the way out a friend said he was surprised she had included a Coldplay song! Good on her, as it’s a great song and she did it justice. After attending with an open-mind about the new ‘Saviour of Country Music’ I was genuinely impressed by her songs when sung live; and boy what a voice the girl has. It’s difficult to pick out highlights; but her Grandma’s favourite song Fine; with its haunting pedal-steel was magical; and when she was left alone to sing Merry Go Round; it was a spellbinding four minutes; with the audience actually singing a verse and the chorus relatively in harmony. When the band returned they eschewed their electric instruments to stand around the singer and eventually play a couple of acoustic songs; but interspersed with band members performing ‘party tricks.’ Much like the guitar changes; it spoilt the mood and the time could have been better utilized with an extra song. Then the final song of the concert had the crowd spontaneously standing up and finally dancing; but that’s mostly because Nancy Sinatra’s These Boots Are Made For Walking was by far the most up-tempo song of the evening and the one that most fans will remember. The encore saw the band gather around the Kacey and the mic to sing an acapella version of Roy Rogers’ Happy Trails Song.